Atif Jadoon leading a meeting. International Youth and Students for Social Equality (IYSSE) at NEIU is a newly formed student organization at NEIU. IYSSE is dedicated to mobilizing young people around the world in a fight to combat the ever expanding and destructive agenda of imperialism, the highest stage of capitalism. Over the past month alone, the Obama administration has made new wars in two countries in the Middle East, Iraq and Syria. IYSSE is an international organization with 24 chapters around the United States. IYSSE also has chapters around the world in Germany, United Kingdom, Australia, Canada, Turkey and Sri Lanka to name a few. I first came into contact with the IYSSE through one of my professors who had us use WSWS.org for our research paper. After reading numerous articles on this site I came to the realization that Northeastern Illinois University and our student body could benefit greatly from having such an organization here on campus. I contacted the IYSSE and extended an invitation to their members to visit our campus. That was almost a year ago and we have been working hard ever since to establish a chapter here on the NEIU campus. Thanks to the hard work of the student activities office and their staff we are officially a chartered student organization. In the past year or so, we have had a few events here on campus. One such event was the International May Day Rally. This rally was viewed by tens of thousands of people around the world as well as by quite a few students here at NEIU. Because the IYSSE focuses on the historical and political education of students and youth, its benefits accrue to the entire community. IYSSE chapters internationally host lectures each semester by historians, art critics and leaders of workers committees. 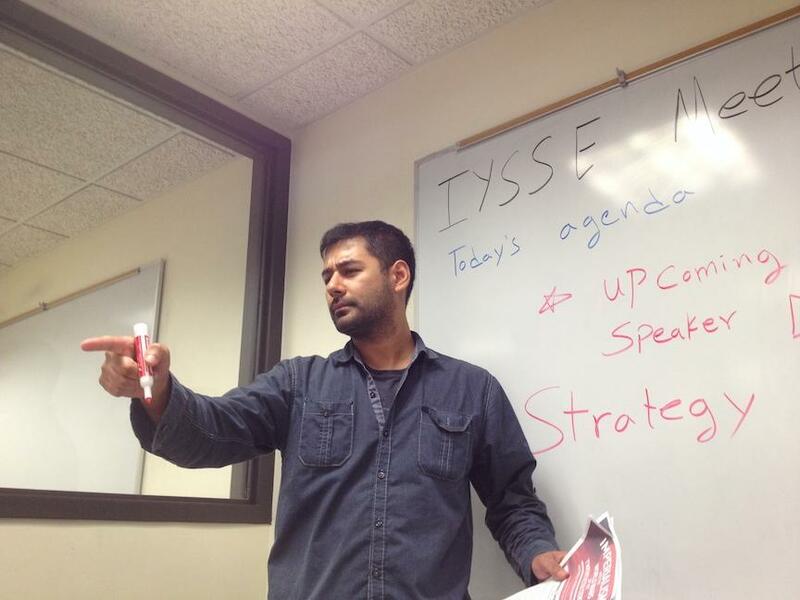 Additionally, IYSSE members are trained in reporting on social and political issues for the World Socialist Web Site, the most widely read socialist publication online. IYSSE members are also involved in photography, video and other media production. Some recent examples of IYSSE work include the Wayne State IYSSE’s critical role in the demonstration to defend the Detroit Institute of Arts from the sell-off of its priceless assets, and success of the Workers Inquiry into the Bankruptcy of Detroit. The IYSSE at Berkeley conducting a university course on the history of the international Marxist movement in the 20th century. The IYSSE at NEIU is looking forward to bringing these kinds of exciting activities to the campus and the community. I have always been interested in politics but never had the right outlet. As President of IYSSE at NEIU, I want to help our students better understand current affairs and take the proper steps to improving the state of the working class locally and globally. Members of the student body who believe in social equality, the fight against war, the social rights of the working class to a decent job, housing, education, healthcare and the right to culture can join us for our weekly meeting every Tuesday at the Fine Arts Building in Room 216 from 6-7 p.m. Come check us out on our Facebook page: www.facebook.com/IYSSE.NEIU; you can also email us at [email protected] for any questions you may have. We will be hosting an event here on campus on September 30th in the BBH building Room 101 from 6-9 p.m. David North, author of “The Russian Revolution” and the “Unfinished Twentieth Century,” will give a lecture titled “Imperialism and the World Wars of the Twentieth Century: Historical lessons and present dangers.” There will be a question and answer section following the presentation. Refreshments will be provided. I invite all of our students here at Northeastern Illinois University to learn more about social issues that plague us as well as about Socialism by visiting our parent organization’s website www.wsws.org. Make the decision to join and build the IYSSE chapter here at NEIU.